The pie chart below shows the main reasons why agriculture land become less productive. The table shows how these causes affected three regions of the world during the 1990s.Summarise the information by selecting and reporting the main features and make comparisons where relevant. The two given charts show the information about a number of the main factors which lead to the land degradation in general and in 3 different areas in particular during the 1990s. It is noticeable that the largest part over- grazing which is considered as a primary reason causing the decrease of land quality in the world. The table illustrates that Europe had far higher proprtion of unproductive land than North America and Oceania in 1990s. The pie chart clearly shows that there is a large propotion of over-grazing over 35% in total. While deforestation and over-cultivation account for two smaller parts, 30% and 28% respectively. The smallest part is other fators accounting for 7% in total. In term of the data in the table, it is easy to see that the principal element leading to the land deterioration in Europe is deforestation. This accounts for the massive 9.8%, while a mere 0.2% land in North America and 1.7% land in Oceania were destroyed by deforestation. Over-grazing accounts for the vast majority of the causes to the farmland decline in the large group of islands in the South Pacific, about 11.3%. By comparison with Europe and North America It causes only 5.5% and 1.5% land destroyed respectively. Over- cultivation part accounts for a lowest percentage of reasons compared with other areas. The pie chart below shows the main reasons why agriculture (wrong form) land become (wrong verb form) less productive. The table shows how these causes affected three regions of the world during the 1990s.Summarise (bad spacing) the information by selecting and reporting the main features and make comparisons where relevant. It is noticeable that the largest factor part (missing word) over- grazing (bad spacing) which is considered as to be a primary reason causing the decrease of land quality in the world. The table illustrates that Europe had (missing word) far higher proprtion of unproductive land than North America and Oceania in 1990s. The pie chart clearly shows that there is a large propotion of over-grazing (missing punctuation) over 35% in total. While deforestation and over-cultivation account for two smaller parts, 30% and 28% respectively. (fragment, incomplete sentence) The smallest part is (missing punctuation) other fators (missing punctuation) accounting for 7% in total. In term of the data in the table, it is easy to see that the principal element leading to the land deterioration in Europe is deforestation. This accounts for a the massive 9.8%, while a mere 0.2% land in North America and 1.7% land in Oceania were destroyed by deforestation. Over-grazing accounts for the vast majority of the causes to the farmland decline in Oceania, the large group of islands in the South Pacific, about 11.3%. By comparison with Europe and North America It causes only 5.5% and 1.5% land destroyed respectively. Over- cultivation (bad spacing) part accounts for a lowest percentage of reasons land degradation compared with other areas. 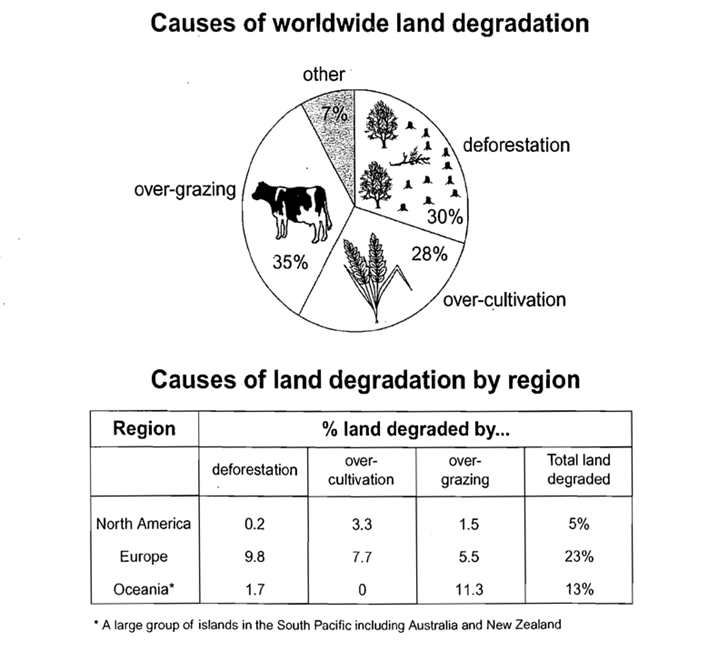 The pie chart and table describe the reasons of destruction of farming land in three different areas in 1990s. Averagely over grazing has been known as a main cause of drop in productivity of agricultural land with devastating the 35% of agricultural area. Over-grazing, over-cultivation- deforestation and other is introduced as a most important devastating parameters which decrease the beneficial of agriculture. First of all, Europe region suffer again 23% total land degraded, while, just 5% of agricultural land degraded in North America and 13% degradation noted in Oceania. Deforestation was the most significant cause of agricultural land demolishment in Europe by 9.8% and over-grazing by 11.3% introduced as a main reason in Oceania, while, Over-cultivation but had not any effect on agriculture productivity there. In North America over cultivation and deforestation had the most and the least effect respectively. Totally, apart from over-grazing, Europe had the most percentage of degradation by introduced variable, in comparing with other two areas. javadtavakoli, are you also the user hoangmyanh, posting a revision of your essay? If you are a different user, please start a new thread. Don't post replies on someone else's thread. could you pls tell me how am i able to submit my essay? Click on "Ask a Question".